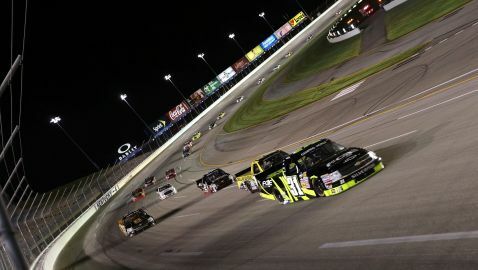 Historically speaking, standings leader is the favorite to win his first NASCAR Camping World Truck Series championship when the checkered flag waves on the 2012 season Friday night at Homestead-Miami Speedway. Just twice since the season finale shifted to South Florida in 2002 has the points lead changed hands in the final event. Travis Kvapil is the only third-ranked driver to advance to the title, leap-frogging Ted Musgrave and leader Brendan Gaughan in 2003. Ron Hornaday Jr. made up a 29-point deficit to catch Mike Skinner in 2007. Jack Sprague is the only other second-place driver to prevail in the finale, edging Greg Biffle in 1999. With five competitors mathematically in contention for the championship, however, anything’s possible – including a replay of 2003 when all four contenders held the theoretical points lead at various stages of the event, which turned on Musgrave being penalized for jumping a crucial, late-race restart. Buescher’s lead is somewhere between comfortable and tenuous, depending upon the performance of his rivals. Veteran Timothy Peters trails by 11 points; Sunoco rookie Ty Dillon by 12; Joey Coulter (-29); and Parker Kligerman (-37). The number of championship hopefuls matches that of 1999, but the overall point spread is closest ever. Buescher, 22, can clinch the title by finishing seventh with no laps led, eighth with one or more laps led and ninth with the most laps led.